?????????? BRITISH CHAMPS IS COMING TO LONDON ?????????? It's the third game of the season in the South division of Tier 1, women's British Championships and it's London Rollergirls' turn to host, and we are bringing you two nail biting games to keep you on the edge of your seat! 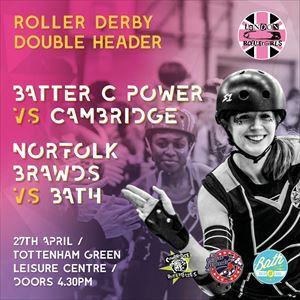 First up, you'll get to watch our very own Batter C Power, take on Cambridge Rollerbillies, followed by a second exciting match up between Norfolk Roller Derby and Bath Roller Derby. Doors will open at 4:30 - be sure to get your tickets in advance, as our last home game was a sell out! Don't forget about our fabulous bring-a-friend bundle, which gets you a huge discount when you come in a group of 4! ???? Just to add to the excitement, we'll be holding a JUNIORS BOOTCAMP prior to the game.